That takes a long time with crop farming alone. Once all your farms have been maxed out and the buildings upgraded, FV-coins will start piling up quickly. These FV-coins can be converted into XP by purchasing items (see belted cow) to help you level up much faster than you can do with crop farming alone. The primary goal for the advanced player will become coin-generation rather than direct XP-generation. The neighbors remain VERY important. Keep adding neighbors at every opportunity. the facebook friends will also show up in your gift request listings. Keep adding people that you see commenting as facebook friends, so you can follow their facebook feeds. The facebook feeds are very important to get all the items you need for continued growth. Max out all farms size-wise as much as you can, preferably without spending FV-cash. Larger farms produce more coins and XP points for every crop harvest. Mastery for longer growing crops that require high harvest numbers becomes a lot easier when you have more plots each harvest. Buy combines for all farms and upgrade them to max range of 4x4. This allows to replant > 50x faster than without vehicles and 3-4x faster than with separate vehicles. Fuel can easily be obtained in sufficient quantities from mystery eggs and from recipe samples. Get mystery eggs by visiting neighbors and from the feeds. Maximize the use of your craft buildings to make goods that you can exchange for fuel + get sample goods from the feeds. If you do this, you will rarely need to purchase goods to get fuel. Free-ranging animals: quantity before quality. Place any and all animals that you can get off the feeds. Calves are the highest-yield animals outside animal buildings, and are easy to get for free from the feeds. Place as many calves on your farm as you can get. 1000 calves will harvest for 80,000 coins every day. Discard foals and other free-roaming animals, and replace them with the higher-yield calves instead. Use farmhands to harvest free-roaming animals on your farm. Build orchards to speed up mastery of long-growing trees. Use orchards to shorten the harvest time of long-growing trees to master them quicker. Get rid of lower-yield trees as soon as you have mastered them. Place the short-growing trees (2-day harvest time) on the farm without orchards! Use arborists to harvest them for maintenance-free coin generation. Arborists cannot be used to harvest orchards. Discard the calves and low-yield trees in favor of the higher-yield trees if you start running out of space, . Animal buildings house up to 80 animals (pasture, Sept 2012) and take up less space than those animals would on your farm. Animal buildings allow to harvest daily or every other day. Some animals take longer outside the buildings. This increases the yield/space significantly compared to free-roaming animals. Find the animals that have the highest harvest values. Find animals with the highest sale values after eggs hatch or babies grow up. Getting eggs or mystery babies might be more interesting than their direct harvest value. Gradually replace lower-yield animals with high-yield animals to maximize coin generation from each building. As soon as you can afford them, start buying belted cows from your market. The XP from the purchase will also help to level up faster. When you start getting crowded for space, gradually replace lower-yield items with higher yield items. Belted cows in a cow pasture give the highest yields in the game (Febr. 2012). At a cost of 80,000,000 coins for each cow pasture, this will be a rather slow process. But once you generate 10,000,000 coins every day, you can level up every day! 60 blue whales per aquarium or swimming pond = 300,000 coins/24 hours/48 dotspaces PLUS 255,000 coconuts/24 hours/48 dotspaces = 260.42 coins/hr/dotspace PLUS 221.36 coconuts/hr/dotspace. (straspberries after mastery = 1.75 coins/hr/dotspace). In Hawaii, use your coconuts to buy blue whales. This will allow you to level up much faster than you can with crop-farming. What animal do I prefer to buy? Belted cows vs. blue whales? purchase price of belted cow = 1,000,000 coins, XP gain = 10,000; daily harvest = 3000 coins. purchase price of blue whale = 500,000 coconuts, XP gain = 630; daily harvest in aquarium = 5,000 coins + 4,250 coconuts. You have to purchase these animals with a different currency, so there really is no conflict. Use your coins to buy belted cows and your coconuts to buy blue whales. What animal building do I prefer? The XP-gain for purchase of a belted cow (10,000 XP) is much higher than for the purchase of a blue whale (630 XP) . For a direct level-up, 10 belted cows suffice. Blue whales are not very useful for that. You would need to by 159 blue whales to get a 100,000XP level-up. The blue whale gives a much higher coin yield than the belted cow, plus an additional boat-load of coconuts that allows you to buy more blue whales very quickly. The belted calves remain babies without any significant yield and are totally useless for your game progression. The mystery babies from the blue whale grow up to be blue whales. This makes the number of blue whales grow much faster than by purchase alone. These advantages are cumulative over time, like compound interest. 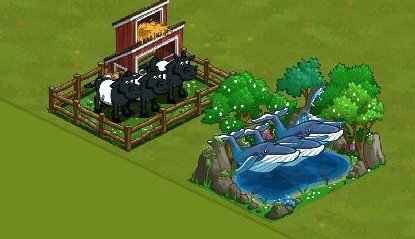 You can build aquariums and swimming ponds and fill them with blue whales a lot faster than cow pastures and belted cows; and they give a better yield as well! This makes the blue whale the more attractive choice for long-term growth and progress. It is obvious that filling your farm with cow pastures and/or swimming ponds will take a very long time. Because belted cows and blue whales have to be purchased with different currencies, cow pastures and swimming ponds can co-exist side by side until you start running out of space. As long as there are still cow pastures to fill, belted cows remain useful in the game because they can convert the excess FV-coins into XP for a quick level-up and the purchased cows will give additional revenue production. However, the swimming pond with blue whales gives a much better yield than belted cow pastures, so cow pastures could eventually be phased out to be replaced by blue whale swimming ponds. Once the cow pastures are filled (or gone,) the quick level-up effect can be obtained by purchasing and selling other high-coin items e.g. mansion for 5,000,000 coins = 50,0000XP. Swimming ponds with blue whales generate a lot more coins and coconuts than orchards or bloom gardens can and will be the preferred building in the long run. Orchards will still be needed for tree mastery and because they can be used to generate a lot of Jade coins (see here). What trees do I prefer to harvest in my orchards? The azalea bonsai II harvests for 900 coins/harvest. The Choco Macadamia harvests for 150 coins and 425 coconuts. 400 orchards filled with azalea bonsai II trees generate 7,200,000 coins per harvest. With this direct revenue you can buy 7.2 belted cows. 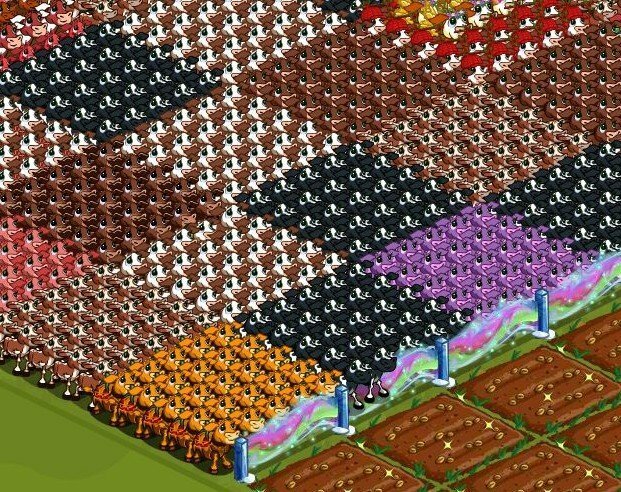 Those 7.2 belted cows can be harvested for 21,600 coins every day. With this indirect revenue you can buy 1 extra belted cow every 47 days. 400 orchards filled with Choco Macadamia trees generate 1,200,000 coins and 3,400,000 coconuts per harvest. With this direct revenue you can buy 1 belted cow + 6 blue whales. = MORE-value of +16,000 coins + 25,500 coconuts every day! With this indirect revenue, you can buy 1 extra belted cow every 30 days and 1 extra blue whale every 20 days! The direct harvest value in FV-coins is higher for the azalea bonsai II vs Choco Macadamia, but you get no coconuts. The indirect harvest value = the daily harvest value of the belted cows and blue whales that you can purchase after your tree harvest is more advantageous for the Choco Macadamia. The difference may seem small on such a large number of orchards, but keep in mind that you can harvest your orchards every 2 days. That adds up quickly to make a major difference in your long-term progress. It is obvious that the swimming pond with blue whales gives a much higher yield than an orchard with choco macademia trees. When you get crowded, swimming ponds will be preferable over orchards.